I’ve finally brought the Spelling Words books to completion. They have been years in the making, if you include the pondering and musing that sometimes goes on for quite a long time before a book takes form. I first started turning spells and spelling over in my mind in the late nineties. I knew that other writing traditions had magical or sacred aspects. 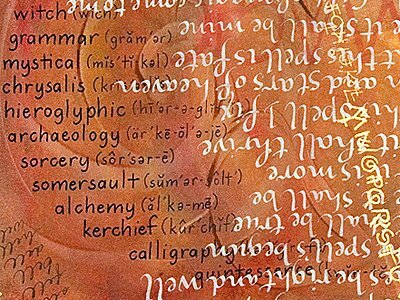 Ben Shahn explored this in his Alphabet of Creation, the story of the creation of the world through the Hebrew letters. Islamic calligraphers create beautiful calligraphy of the Qur’an as acts of worship. I read that “seed syllables,” letters of the Siddam alphabet, are chanted by Buddhist monks to attain communion with the divine, and the copying of sutras is considered prayer. So where is the Western tradition of sacred calligraphy? Perhaps American schoolchildren singing their alphabet song are not so different from those Tibetan monks. There is a history in the English language of early medieval bards singing charms and spells, and practicing the magic of storytelling. Then the word spelling also began to mean correctly arranging the letters. Medieval calligraphy certainly reached heights of beauty and decoration, in the service of worship. But writing, or the letters by themselves, did not continue to be seen as particularly sacred. It is easy for us to marvel at the sacred inscriptions of other cultures, but I find that veneration for calligraphy missing in our own Western culture. Still, anyone who has practiced calligraphy for any length of time has encountered a very meditative state. Practicing letters can be very calming, and depending on what your meditation is, can be an act of prayer. It is a path, and can become a spiritual practice.